On Saturday, January 5, 2002, the Chapter hosted its 8th edition of Frost Bite Follies. We had an excellent membership turnout, a record number of fish caught, a heaping pile of trash picked up from the river banks, and the weather cooperated! You can’t ask for much more from a fish-a-long. 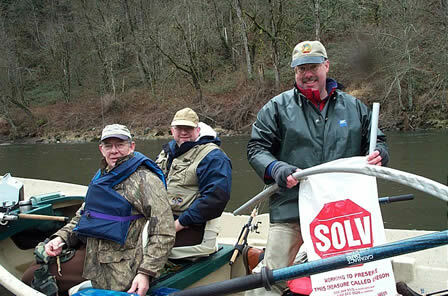 Ray Hinea with Jerry Hofer, and Dave Morelli and the trash they collected at the Camp Collins beach. We had 36 fishermen hook 32 fish. 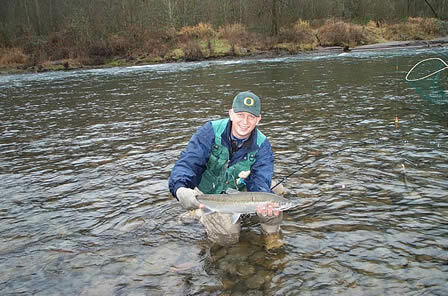 Twelve steelhead were landed with a couple released. One member even caught a 14 inch cutthroat. Lennie, how much fight did that fish give you on steelhead gear? The hot boat for the day was Eric Neiwert’s. He and his crew hooked 8 fish, lost 3, kept 4, and released 1. Eric, now’s the time to take up bowling, you’ll never have a day like that again! Jack Glass’s, Lennie Green’s, Trevor Storlic’s, and Jim Thurber’s boats also saw decent action for the day. The hard luck award has to go to Norm Ritchie and his crew. They hooked 7, lost 6, including 2 that broke off, and landed only 1. Well, Norm, at least your boat saw some action. Now for the big THANK YOU’s to those who helped out. First, to the boat captains: Bill Beith, Bill Cluney, Norm Ritchie, Jay Burris, Lennie Green, Jeff Stoeger, Jim Thurber, Jack Glass, Brandon Glass, Trevor Storlic, Eric Neiwert, and Ray Hinea. Without these guys, Frost Bite Follies is just another day on the bank. Second, to Gus Kriara and crew at Camp Angelos. The excellent food and the hospitality is greatly appreciated. It is the perfect mid-day break. Finally, to Jeff Stoeger, Vaden Green, and Ray Hinea. These are the guys who organized the event and made it happen without a hitch! For those of you who participated, thank all of these people at the next Chapter meeting. All of the people mentioned here are responsible for you having a great time on the river. Oh yeah, let’s also thank the BIG GUY upstairs who brought you the great weather!!! For those of you planning ahead, next year’s Frost Bite Follies will be on Saturday, January 11th. 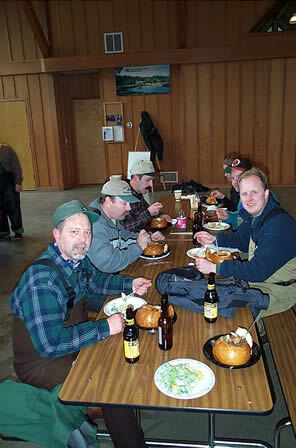 If you are still looking for a steelhead "fix" look for news of the Wilson River Wild Fish Broodstock event, hosted by the Association. See you on the river. 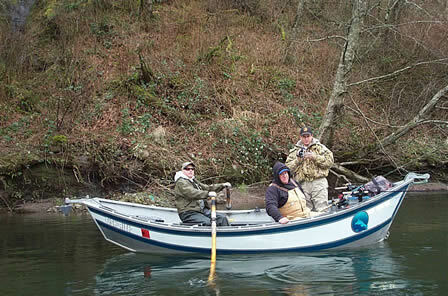 Trevor Storlie, Scott Kappes, and Bill Hoff in Trevor's boat pull a little diver and bait in a search for steelhead while Scott videotapes for the Hot Tamale outdoor show. The one that got away, This is an old oil tank (sorry the picture is blurry I moved.) 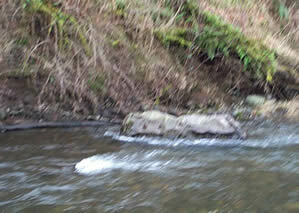 that is sitting in the river and is needing to be pulled out on our next trip. This will be a job as it is about as big as a table. I don't think it will move before our next cleanup this spring.